If you are self-conscious about cracked, broken, decayed, or worn teeth, Dr. Conti can bring back your healthy, natural-looking smile with crowns. Crowns are also frequently called “caps”. A crown can return function, structure, and strength to a tooth with extensive decay or damage. It is designed to function as a healthy tooth and will protect your tooth from further damage and preserve the jaw's correct natural alignment. We use precious metal, porcelain-pressed (or fused) to metal, or all-porcelain crowns. 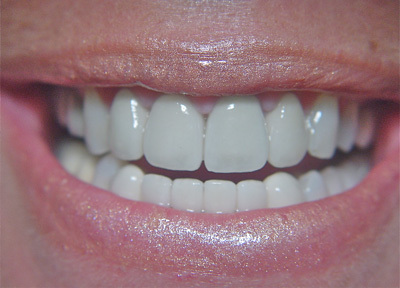 Our precise color-matching system allows us to find the right shade of porcelain to blend with your natural tooth color. Crowns are durable and long lasting. Typically we can design, fit, and place your crowns in two appointments. Once a crown is placed, you can care for it as you do your natural teeth. If you have lost teeth due to accident, injury, or gum disease, we can create a permanent bridge to restore your smile. A bridge not only fills the gap, but it also prevents shifting of remaining teeth. It can also correct a misaligned bite, improve chewing function and speech articulation, and provide internal structure for the face to give you a more youthful appearance. What is a fixed bridge? A bridge is a prosthetic tooth (or teeth) that attaches on one or both sides to teeth prepared for crowns. A fixed bridge is permanently joined to the neighboring abutment teeth (crowned teeth) and consists of three basic units: the false tooth or teeth (called a pontic) and two abutment crowns. The type of bridge we suggest will depend upon the strength and health of the abutment teeth, as well as the location of the gap in relation to the rest of your dentition. Conscientious brushing and daily flossing will protect the base of your crowns and bridges from bacterial growth and decay. Be sure to see us at least two times each year for professional cleanings and a yearly preventive exam. If you have any questions about crowns and bridges please call our dental office for a consultation. We will be happy to discuss the options and schedule your evaluation. Website Designed, Hosted and Promoted by Digital Eel Inc.